This is the third in a series of pre-holiday posts this week to highlight some small but potent high-tech devices, suitable for IT pros and enthusiasts alike, be they for yourself or somebody else on your Christmas list who fits that designation. Today’s item of interest goes a bit bigger than the previous entry, and advises readers that older PCs (especially notebooks or laptops, not tablets) with Secure Digital (SD) ports can now accommodate 128 GB of storage in that form factor as well. These are noticeably cheaper than their micro SD counterparts — about half the cost, in fact — and generally fall in a price range from $40 or thereabouts for slower models to $70 or less for faster ones. All the big names in flash memory, and lots of lesser lights as well, come into this mix as this Google search will happily demonstrate. Even more recently 256 GB models have become available, but these are considerably more expensive, with a much wider range of prices. 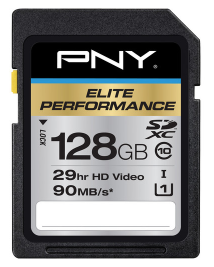 The cheapest I can find is a PNY model from the same series as the 128 GB model shown above, starting at about $110, climbing quickly into the $200 range for models from Kingston and Lexar, and above $300 for models from most other makers (e.g. SanDisk, Delkin, and a 1000X model from Lexar). Either way, 128 or 256 GB of reasonably fast (about on par with a 5,400 RPM hard disk if CrystalDiskMark results are any guide to performance) can provide a considerable storage boost to notebooks or laptops, especially those (like two of mine) that have only 120ish GB of SSD storage installed as their primary drives. For the 128 GB models, this is significantly cheaper than buying a 256 or 512 GB 2.5″ SSD, and a lot easier to install. But for those to whom a 256 GB bump seems warranted, I’d recommend migrating from an older, smaller SSD to a new and bigger one instead of plunking down the cash for a 256 GB SD card. With el-cheapo 250ish GB SSDs readily available for around $100, and higher performing models in the $130 range, this makes a lot more sense, as this Newegg search demonstrates.